My wife's family was originally from Conneaut, Ohio. 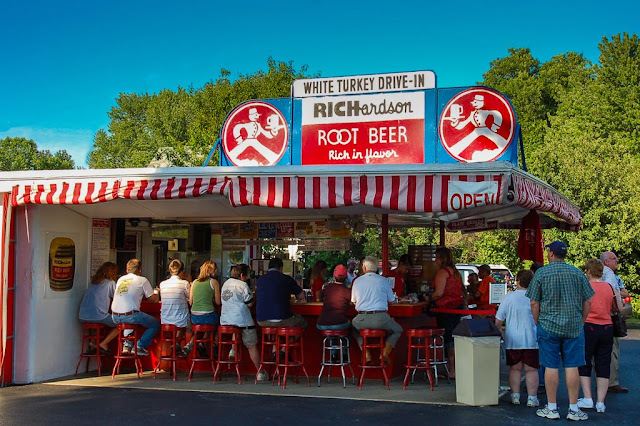 During trips there and to Erie, PA we would drive by the White Turkey Drive In. The White Turkey Drive in has great food and fabulous Richardson Root Beer - right from the barrel! The restaurant is a family owned business established in 1952 and named after the turkeys the family raised and used in their famous turkey sandwiches. The service is fast and it is great fun to sit at the counter. Don't worry though if you cannot get a seat at the counter as there is additional seating around back. If you are ever in the area, you owe it to yourself to try out this gem of a restaurant. Make sure to check out the website too and see what is on the menu!